I was looking through some fairly old, obscure utilities and ran across a reference to the "ROMDISK OS." Anyone ever hear of this before? 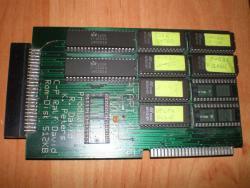 The romdisk was an upgrade from Germany that plugged into the PBI port. 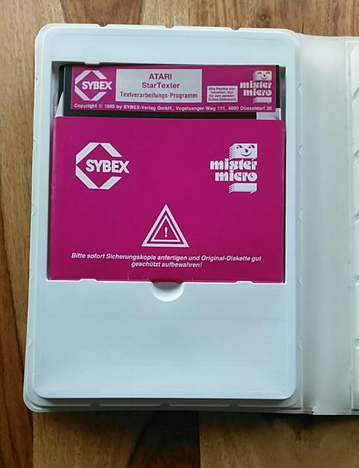 It came with a tool disk so you could convert your disks into special 64k ROM images. You'd then program 64k EPROM(s) with your disk content and plug them into the romdisk. The romdisk OS was needed so you could actually use your "disks". It had a menu (accessible during powerup and reset) so you could select which of the maximum 8 "disks" to use. With hotkeys (available during normal operation) you could select which drive number to use for rom-disk access and IIRC you could also select which of the disks to use. The romdisk OS had a builtin Ultra-speed highspeed SIO code which was fairly neat, too. By default it booted from your real floppy and had the rom-disk mapped to D2:, but you could also choose to boot from one of your rom-disks (powerup with IIRC select to bring up the menu) and choose your disk. Thanks, Hias! That is quite neat! 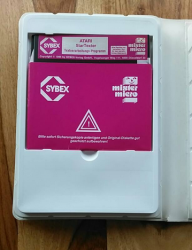 I've seen somewhat similar devices (from the 80's and 90's) that allowed you to put stuff into eproms that were plugged into a multiple-eprom cartridge, but I've never seen one that attached to PBI or was that sophisticated. Thanks for the pic and sharing. BTW, looks like it had a PBI pass-thru on the side? The ROMDISK as far as I know wasn't really PBI compliant. It just used some of the available signals on the PBI. If it was full-beans PBI, it probably wouldn't have required a replacement OS ROM. Looks like a pair of PIAs, I'm assuming for addresses and EXTSEL asserting. I am curious as to why two were needed; by my simple math: 512Kb = 256 bytes per "sector" means you need 2048 possible sectors = 11 bits. Since a PIA gives you 16 bi-directonal lines, what are the remaining lines used for? Yes, probably not but that still leaves the 50-pin connector on the side unaccounted. A possibility might be that the lines do pass through, and the the ROMDISK OS can be disabled and a compliant HD could be used -or- there was another non-compliant device that could be attached/used. (?) Perhaps Hias will remember. Sort of funny way of implementing it - since it's not PBI compliant, it could practically have been done on a cartridge although I guess in the day there probably wasn't a 512K EPROM available. I should think that extra connector is PBI pasthru, otherwise why have it with so many pins. Agreed too, strange it just wasn't done as a PBI compliant device which would eliminate the need for a custom OS. The 2 PIAs - yes strange again that 2 would be needed. Maybe there's a header underneath or something that allows the user to interface the unused Port bits? I wouldn't count on it. From what I seem to remember, this interface isn't very smart, hardware wise. AFAIK a user group called ARGS was involved. The name alone made the hairs in my neck rise, as their hardware usually was incompatible to just about ever other piece of hardware because of the way they "hacked" it into the system. Very nice device. I have two of them. You not only have the SIO-highspeed, but also a single line monitor you can call (AFAIR Ctrl-Shift-M) - changing addresses for cheats etc. Since the burn-file generator was very slow (Basic), I once created a native PC cmd-line app for the job (XFD ( ) to ROM file). Don't hesitate to ask if somebody needs it here. The hardware is very simple, basically it's just 2 PIAs that are connected to the EPROMs. There's not much on the back of the PCB, just bypass caps at the EPROM sockets and a pulldown resistor network at the PIA pins interfacing to the EPROM data lines. And there's a large rubber foot so the PCB isn't hanging off the PBI connector only. The PCB didn't even have an address decoder, you needed to bring out the $D1xx access signal from the LS138 to some unused PBI pin (you also needed to add +5V to the PBI, too). Originally the empty socket on the lower left of the picture contained the OS ROM. You needed to disable the internal OS (clip off and pull up /CE of the OS ROM) and also bring out the OS /CE line. Or - as I did - replace the internal OS (I used a 32k EPROM so I could switch between stock XL OS and RomDisk OS). The 50-pin connector on the lower right of the picture is a PBI passthrough. For some unknown reason the didn't hook up A14, A15 and AudioIn (I guess they had some routing problems, both sides of the PCB are covered with tons of traces), so you needed to add some wires if you wanted to use it. But, hey, at least it had a PBI passthrough connector! Back then I used the PBI passthrough to hook up my original Turbo-Freezer XL, but this wasn't 100% mechanically stable (since the freezer PCB is standing upright). The romdisk surely was cut down to a price (so no "real PBI" as some might complain), but it worked amazingly well. After all, if you had the money to buy a BlackBox or MIO, or even had one of those, you wouldn't bother to take a closer look at the romdisk. But for all others it was a very neat upgrade. Sure, taken the simplicity of the circuit it could also have been done as a cart, but then you'd have a real huge PCB sticking out of your cartridge port. Not nice and a mechanical nightmare. 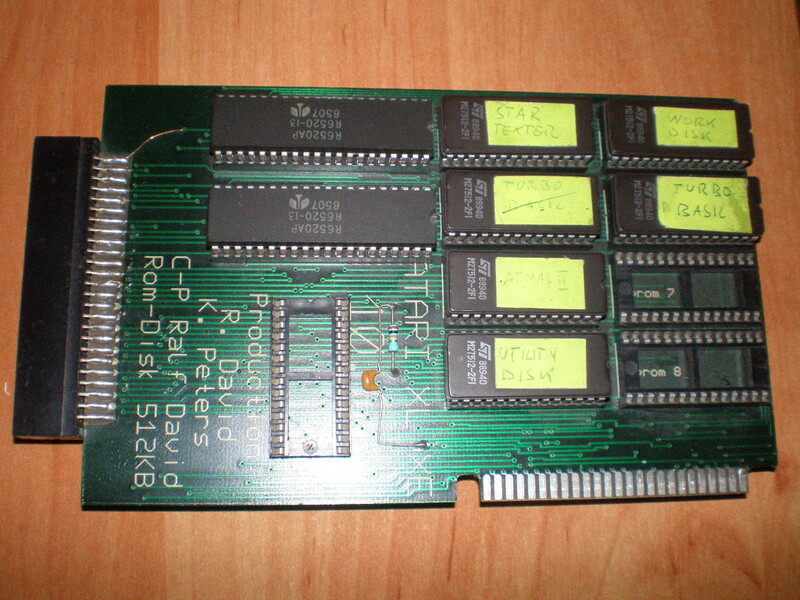 The datecode on my PCB says 10/89 and IIRC back then EPROMs larger than 64k still were somewhat uncommon and expensive. And you also would have needed an EPROM programmer that could handle these - most common programmers just had a 28-pin socket, so the maximum supported size was 64k (27C010 and larger came in 32-pin packages). 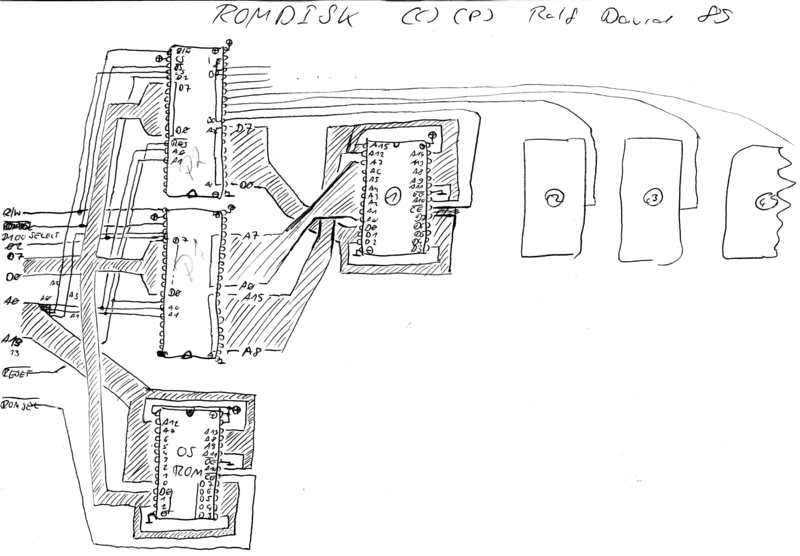 BTW: I found a PDF version of the romdisk manual on Carsten's website: http://www.strotmann...nstallation.pdf. The manual is in German, but google translate works with the PDF, so have fun reading! Cool! Thanks again, and it looks like Google does a very good job translating the docs. Sorry to bump such an old thread, but I wondered if you had the ROMDISK OS? 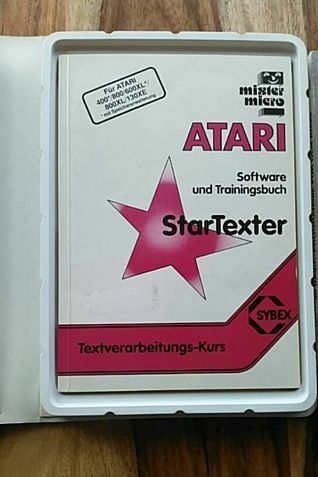 There's a copy at AtariOnline, but it looks like they've modified the disk to use a Polish fonts (Edit: Plus Polish language prompts for the application and utilities). Has a clean dump of this ever been made, or does anyone have a version with at least the original fonts? Edited by MrFish, Tue Apr 11, 2017 8:23 AM. Edited by MrFish, Tue Apr 11, 2017 8:18 AM. StarTexter was more or less the gold standard for A8 word processing in Germany. Supporting umlauts and 'ß' without any hassle, providing a solid printer support and having a 80 char per line scrolling display is of great use. Even a printer preview, showing all 80 chars per line via the typical graphics 8 display is included. 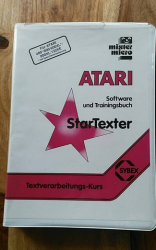 Without the other systems, this would be still my favourite choice for word processing (confessing that I not have tried "The Last Word" yet). Edited by Irgendwer, Tue Apr 11, 2017 11:41 AM. It looks quite capable. I see it mentioned variously around the net and a few copies for sale. I'm surprised a dump of the original version isn't floating around. 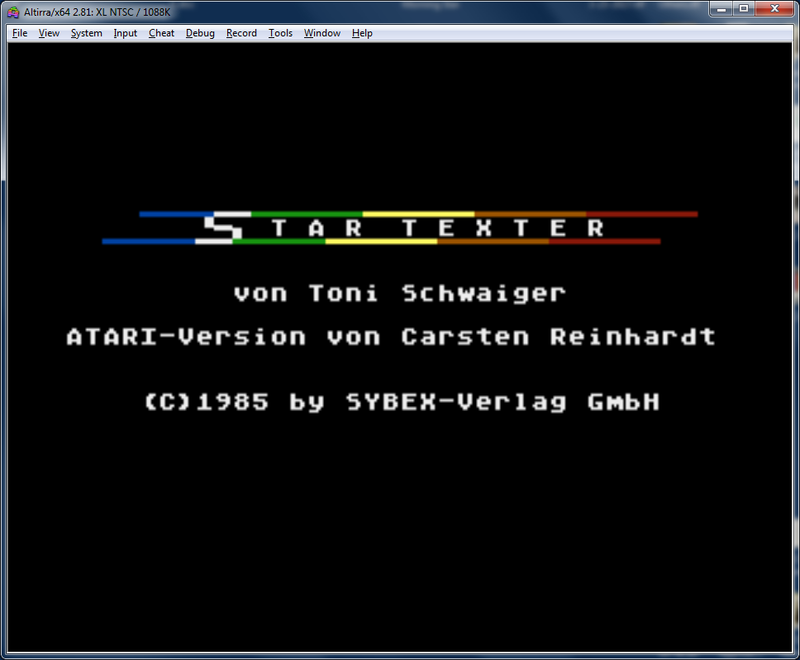 There were also versions on other systems, such as for the C64, which had several versions made for it. I guess it takes part of its name from the famous WordStar. Edited by MrFish, Tue Apr 11, 2017 12:35 PM. I was able to dig up a manual. I really do like when programs are converted to all available languages and display types (NTSC PAL SECAM) etc etc.... that being said I also like bugs fixed and updates made to make something as great as it can... however for the love of God I wish the original versions are included alongside them as well... and then if we go a step beyond and do a radicalhack/trainer/unlimited lived contrivance... It would be AWESOME to have the original, the completely improved version, and then the trainer lives hack alongside each other. This allows for the community and users as a whole to not use enjoy but learn something. It also honors the original programmers, graphists, artists and their home base as well. Keeping the passion is a good thing! Edited by _The Doctor__, Tue Apr 11, 2017 2:10 PM. In this case, I think the version from Poland is just what was floating around there. It'd be cool to get it translated into English, and probably not a whole lot of work (other than the language translation itself). 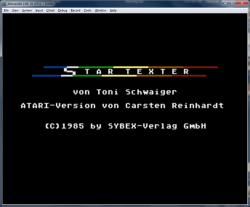 I already had a look at the disk in a hex editor (prompts are just text), and the fonts are easily editable, of course (and already serviceable in their present form, in fact; just one character affects part of the interface; standard characters are, of course, there). Maybe Hias still has his German copy. Edited by MrFish, Tue Apr 11, 2017 2:29 PM.